nds and family this holiday season.My husband is one of those people who anxiously awaits the appearance of eggnogg in stores every November, so I knew he’d love this pound cake. To say he loved it would be an understatement. In fact, he couldn’t stop raving about how good it was. My kids love it too. What I loved most of all about this eggnog pound cake is how incredibly easy it was to make. The secret is starting off with a pound cake mix. I mean, who doesn’t need a few time-saving shortcuts during the busy holiday season? No one will ever know you started off with a boxed pound cake mix! Besides a cake mix, all you need to make these tasty holiday loaves are some eggnog (of course! ), eggs, nutmeg and vanilla. Plus a little powdered sugar if you opt for the glaze. As always, I baked my pound cakes in mini loaf pans. But you could certainly opt for one large loaf pan. You’ll just need to increase the cooking time to about an hour. 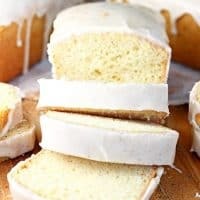 If you are looking to share some baked goods with your friends and neighbors this holiday season, it really doesn’t get any easier than this eggnog pound cake! I’m not sure my husband will let me share with the neighbors, but if I make a double batch, I think I can talk him into it! 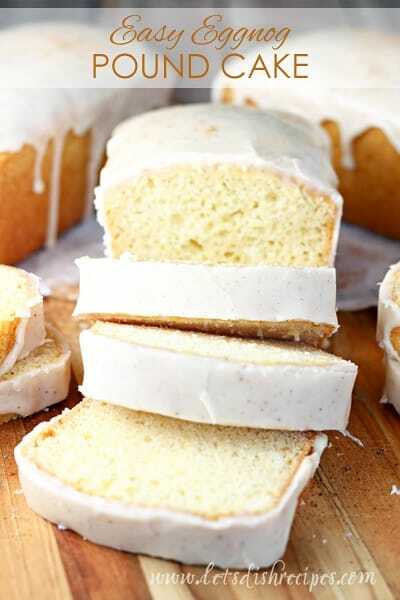 Be sure to save this Easy Eggnog Pound Cake recipe to your favorite Pinterest board for later. 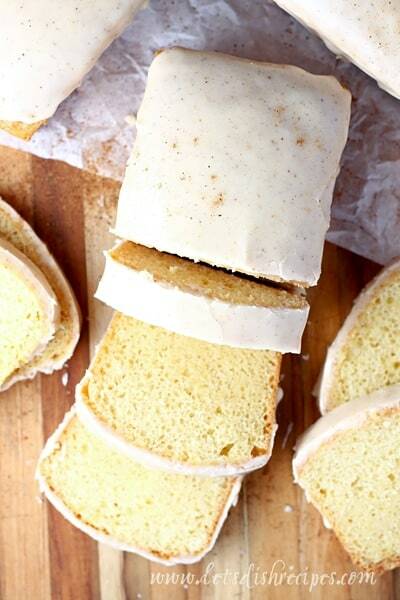 This eggnog infused pound cake starts with a box mix for a super easy holiday treat! Preheat oven to 350 degrees. Grease and flour 4-5 mini loaf pans, or 1 large 9 x 5-inch loaf pan. 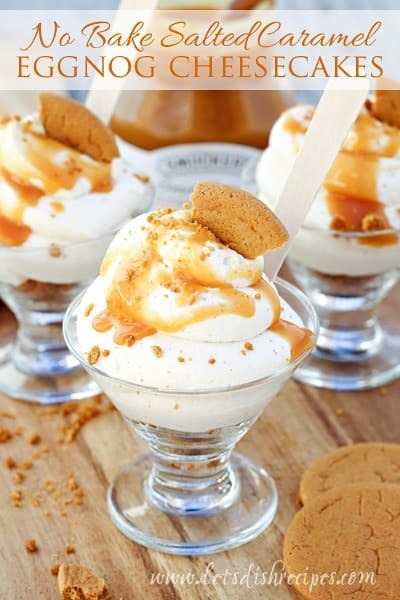 Combine all ingredients for cake in a medium bowl and beat with an electric mixer until well blended. Pour into prepared pans. Bake at 350 for 40-50 minutes for mini loaves (about 1 hour for single loaf), or until a wooden pick inserted near the center comes out clean. Cool in pan on wire rack for 10 minutes before turning o to wire rack to cool completely. While loaves cool, make the glaze by combining powdered sugar and nutmeg in a small bowl. 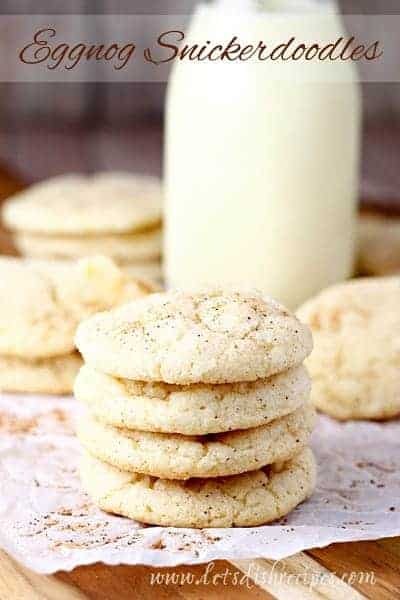 Gradually add eggnog until glaze reaches desired consistency. Spread glaze over cooled loaves, allowing it to run down the sides. Let glaze set before slicing and serving pound cake.